The concept of a song deals with the play order, tempo, and exporting a song as a Midi file. Play Song plays the entire song. Edit Song is used to specify which patterns are in the song, and in which order they appear. 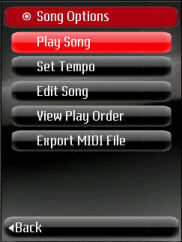 View Play Order allows the play order of the patterns to be viewed in a more compact form than the song editor. Export Midi File is used to export the song as a Midi file.